Sometimes size does matter! Today we’re looking at small trees and their uses in landscape architecture and landscaping sites. There are times when a smallish tree is exactly what’s needed to fill a space, create continuity of line, soften a wall or complete many other architectural plans. If you’re working with a large space, small trees can create pockets of shade or initiate a place for people to gather. If you’re working with a cramped urban area, small trees are ideal to provide that essential greenery to the environs. Plus, smaller trees often require less maintenance and pruning which adds to their appeal. Below we have selected some ideal small trees, all of them stocked here at Just Trees! 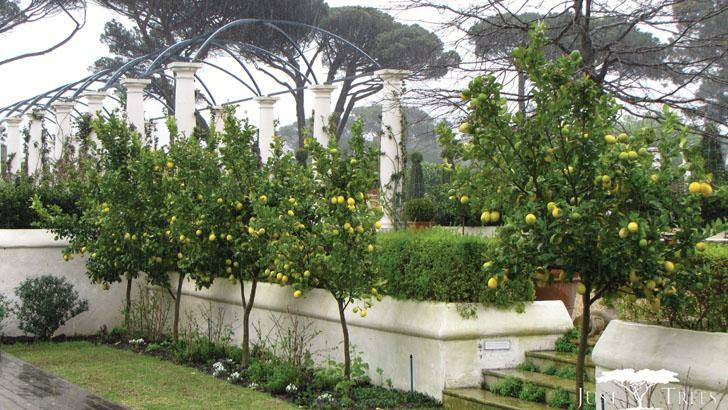 Here we have an example from one of our previous projects at Soetvlei in Constantia, where Citrus limon (Eureka lemon) trees were utilized in a small courtyard area, lining the low wall. We worked on this project with landscape architect Patrick Watson and landscape designer Sheila Boardman in February this year. This small evergreen can also be used as a container tree for courtyards and provides deliciously juicy lemons. If you’re wanting an indigenous species that can handle tough conditions, the Tarchonantus camphoratus or Camphor bush might just be what you’re looking for. This survivor is a semi-deciduous small tree, growing between 3 – 9m and tolerates both frost and drought well. Its attractive grey, silver foliage is an interesting feature and it produces creamy pale flowers as well as a cotton-like fruit that has a crisp and attractive smell. The Camphor bush could work as a feature in a small garden standing alone, but it can also work with several other Camphor bushes to create a screen or hedge, providing privacy or working as protection against wind or sound. Below you’ll see a photograph of a small Tarchonantus camphoratus avenue that we planted about seven years ago in Hermanus. These indigenous trees work well for a pedestrian street, creating both shade ambience without taking up too much space. Another indigenous winner in the small tree category is the Dombeya rotundifolia or Wild Pear. With a non-invasive root system and an attractive shape, the deciduous Wild Pear can be used in many landscaping contexts. 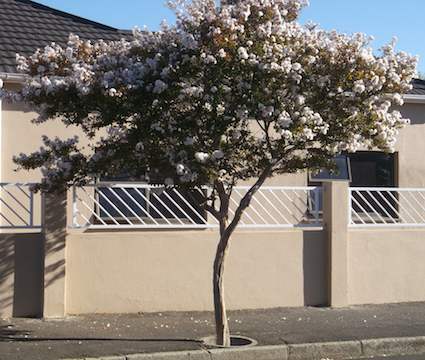 Both for small gardens or spaces as well as streets and sidewalks, this tree requires very little maintenance and is very popular for its beautiful creamy white flowers, which produce a lovely fragrance. The single stemmed tree is both drought and frost resistant, adding to its uses and appeal. Find out more about the many trees we stock right here!